Honor Flight Northwest Ohio is a 501(c)3 non-profit organization formed in 2007 to send the veterans of Northwest Ohio to Washington, DC to see the memorials built to honor their service. To date, 2071 veterans have safely flown on 37 flights to see their memorials. 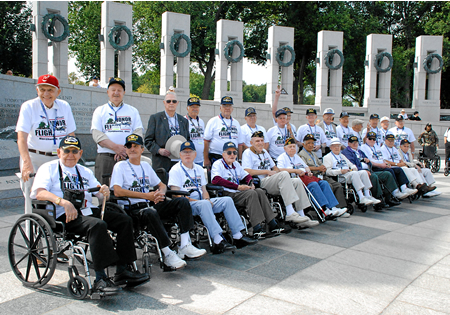 The Honor Flight Network was founded by Earl Morse in 2005. To date, this network, which is comprised of 101 regional hubs in 39 states, has flown approximately 81,000 veterans to the memorials in Washington, DC. As one of the networks safest hubs, we are proud to be a part of this overwhelming achievement. 98% of all donations to our organization are used to get the veterans to their memorials. Our guardians each pay for the privilege of escorting the veterans on this trip. Local medical providers have generously donated the equipment needed for each flight. Our executive committee is unpaid; they too volunteer their time for this once in a lifetime opportunity. The 2014 flight season will be Honor Flight Northwest Ohio’s final flight season. We would like to thank the community for their overwhelming generosity over the years. Please view the links to the left for updated information regarding the 2014 flight season.